May and June can be the best season for hiking (although the rainy season in is June in Japan). And hiking can be a nice “break” from visiting old shrines and temples, which is deemed as the main activity among visitors to Kyoto. Luckily there are several nice hiking courses in Kyoto. Last year on this website, Daimonji Mountain Course was featured for hikers. And around this time of the year, “Kurama & Kibune” can be the best hiking courses because the area will be colored to vivid and tender green. It is just refreshing and relaxing although it is relatively a long hiking course and consists of thousands of steps. First, take the Keihan Line and go to the Demachi Yanagi station. Then purchase train tickets on the Eizan line side. The hiking will start either from Kibuneguchi station (420 yen) or Kurama station (420 yen). Basically the hiking course is between these stations, therefore for people starting from the Kibuneguchi, the goal will be the Kurama station and vice-versa. For hikers planning to start from Kibuneguchi, if there is a bus coming at a reasonable time from Kibuneguchiekimae, it is advised to take it (160 yen). Then visit Kifune Shrine first and start hiking, aiming for Kurama Temple and Kurama station. 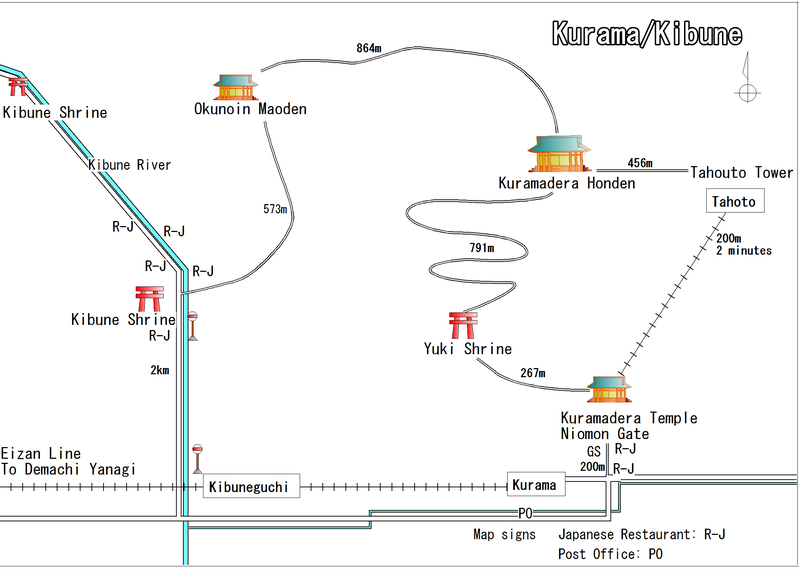 For hikers who start from Kurama station, go to Kuramadera Temple first then follow the path leading to Kifune Shrine. When arriving at Kifune Shrine, take a bus from the bus stop near the shrine (3 minute walk from the shrine) and get off at kibuneguchiekimae (160 yen ) or walk to the station. Remember that One Day Buss Pass (or Two Days Bus Pass) can not be used here. In addition, be sure to bring enough drinks and foods since this area is far away from the city side of Kyoto. For more fun and useful information that will make your Kyoto trip, exciting, memorable, meaningful and stress-free, please check our Kyoto e-Guidebook.